Syracuse is a very important historical center and now also a substantial modern town to the south-east of Sicily. It has an almost unbroken history that stretches back 2500 years, with artefacts to be seen in the town from each historical era. The town is now one of the most visited on Sicily, and because of its monuments and historical importance Syracuse is now listed as a UNESCO world heritage site. Above the city there was a place called Epipoli, with fortified city walls. Ortiga with the historical old town and the wonderful Baroque buildings is an island connected to mainland Syracuse by two bridges. Wandering around the old town you will see many beautiful buildings and really the whole of this part of town is a highlight. Below we comment in more detail on a few of the specific buildings you won't want to miss. Among the most remarkable artefacts in Ortigia, the ancient town of Syracuse is the beautiful Syracuse Cathedral on the Piazza del Duomo. The cathedral was erected on the site of an ancient temple dedicated to the goddess Athena (Minerva) and the ancient temple was retained as part of the new building and the columns can be seen inside the cathedral. The cathedral façade was rebuilt in 1728 in baroque style after the earthquake of 1693. Inside it has three naves, and a baptismal font of white marble which was found in the catacombs of San Giovanni and bears the name of the 7th century Bishop Zosimus. In the two side chapels you can see a beautiful picture by the painter Agostino Scilla (1629-1700) and a statue of Saint Lucia, the Patron Saint of the city, adorned with gems donated by believers, by Pietro Rizzo (XVI century). Among the other precious objects in Syracuse cathedral are a calyx of amber and a book of parchment decorated with golden letters. In Norman times, the cathedral was transformed with the raising of the walls of the nave and new window openings being added, and the apses were also covered with mosaics. Also noteworthy are the statues (the Virgin of the Piliere in the centre, Saint Lucia on the right, San Marziano on the left), and works by Ignazio Marabitti. Particularly remarkable is the Sacrament Chapel (XVII century), attributed to Giovanni Vermexio ('-1648): the chapel is polygonal and has a barrel vault with frescoes by Agostino Scilla (1657) and a ciborium by Luigi Vanvitelli (1752) [1700-1773]. Nearby is the Chapel of the Crucifix, with a rectangular plan, from the 17th century. The high altar, added during the Baroque period, is also attributed to Giovanni Vermexio. Another highlight of your visit to Syracuse is the 13th century Bellomo Palace. Here you can visit the Regional Gallery, which includes several sections with Byzantine, Medieval and Renaissance sculptures. The Art Gallery is well stocked with works dating from the 15th and 16th century and also including paintings of the 14th-17th centuries and, in particular, the "San Lorenzo", attributed to Lorenzo Veneziano (1356-1372) and the "Annunciation" by Antonello da Syracuse (1430c.-1479). There are also furniture, textiles, ceramics, potteries and works of jewellery in the gallery. Another impressive example of a medieval building in Ortigia is the Maniace Castle, built by Frederick II of Swabia (1194-1250) and named after George Maniace, a Byzantine General who opposed the invasion of the Arabs in 1038. It has a square plan with angular cylindrical towers. It juts out into the sea adding to the drama of the castle and setting. The Gothic style entrance portal was originally flanked by two bronze sculptures of rams (one is now exposed at the "Salinas" Museum in Palermo). At the end of the fifth century BC, after the Carthaginian threat had passed, Dionysius very quickly expanded the city walls to include the entire Epipoli hill overlooking the city. The new fortified walls stretched for approximately 28 kilometres, crowned on the highest point by the Euryalus Castle, the most comprehensive military work of Greek Sicily. The Euryalus Castle stands on the Epipoli hill a few kilometres north of Syracuse and was built by Dionysius the Elder (430-367 B.C.). Under the castle there are many tunnels which were originally used for troop movements and a cistern for maintaining the water supply. This Syracuse castle gives us the most magnificent and interesting examples of Greek military architecture in the whole of Sicily. Next you can see the monumental complex of the so-called "Gymnasium", built in honour of Timoleon (411 c.-337 B.C.) and originally a place where they put a lot of statues of famous people. In the Archaeological Park of Neàpolis you will find the most important ancient sights of the ancient city of Syracuse. 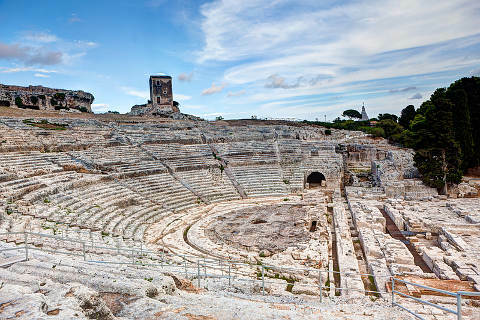 First of all the theatre, the largest on Sicily and attributed to Demokopos dates from the 5th century B.C. and could hold 15 000 spectators. It was built in several stages from the sixth century BC, at which time the stage was still made of wood. Excavated into the rock, the theatre is semicircular with a diameter of 138 metres and 46 rows of stairs. Under the stairs there is a semicircular auditorium for the chorus and opposite is the esplanade where the stage was situated. Next to it there is a huge altar for public sacrifices, and a late Roman Amphitheatre, possibly of the fourth or third century BC, dug in the rock. Elliptical in shape and measuring 70 x 40 metres, the centre was occupied by a tank into which water arrived by two channels. The stairs were originally covered with slabs of stone with two entrances ,while under the stairs there was a corridor which allowed the entry of wild beasts and gladiators. Another place of great archaeological interest is the Latomie Caves Paradise. These catacombs consist of a series of corridors and thousands of tombs of both aristocrats and commoners. Most of them were stripped and violated throughout the centuries, by the Geiserics Vandals, Totilas Goths (549) and Arabs (878). Among the most curious things to see here is the famous Ear of Dionysus. The name comes from Caravaggio, who visited the cave in 1586 and named it after its resemblance to the human ear. From this was born the legend that Dionysus had originally dug the cave to use as a prison and to listen to the speeches of the prisoners, given the acoustics properties of the cave. In the garden of the Landolina Villa (on Theocritus Avenue) there is a Museum which covers two levels and has artefacts dating back to prehistory. The rich pre-Hellenic (pre Ancient Greece) items are from the civilization of the ancient Sicilians, with various collections of vases from the necropolis of "Fusco" and Megara Hyblea, which was razed to the ground in 482 BC by Gelo. The statues, though not numerous, are representative of their period. There are two statues, the famous Venus called Landolina and an ephebic torso from Lentini - a very beautiful marble statue of Kouros from the fifth century BC. The torso represents a young athlete in the prime of his physical vigour. There are also some finds from the Doric colony of Megara Hyblaea - votive statuettes of Demeter and Kore, a Gorgon and the Venus Anadyomene. This is a statue which has aroused considerable interest because of the great accuracy of the anatomical details of the back and hips. It represents the traditional Praxiteles ('-326 B.C.) view of the goddess as slightly 'bent forward' with a dolphin beside him, while he is out of the water and is covered with a mantle shaped-shell. You can also see the collection of coins and of pottery, which are also among the main attractions of the museum. (2) the Temple of the goddess Athena, in Doric style (V century), which was always the most revered temple,built to commemorate the victory of Imera against the Carthaginians in 480 BC. The city of Syracuse overlooks the sea and is surrounded by a fertile plain rich in citrus fruits and vegetables. It therefore abounds in fresh products and its food reflects this. Among the starters try pasta with walnuts (a pasta with meat sauce and walnuts) and the 'fried pasta from Syracuse' (spaghetti with a sauce of olive oil, garlic, anchovies and breadcrumbs). Also very tasty is the tuna cooked with potatoes, tomatoes, peppers and onions; and a dish made of rabbit meat, green olives, celery, tomatoes and capers. Popular local desserts are made of marzipan, also the 'Eyes of Santa Lucia' (cookies); the 'Buccellati' (with candied orange, figs, raisins), the 'Cassata', Sicilian cake or ice-cream with candied fruits (sponge cake, marzipan, ricotta and candied fruit) and the 'Cubbaita' (nougat made of sesame seeds). The almonds from Avola are also held in high renown as are the 'shells' of Noto (marzipan shaped shell filled with jam). Fine wines produced in the region include the "Moscato from Noto" and Moscato from Siracusa. While Syracuse is an unmissable highlight when you visit this part of Sicily, it is also true that it can be very hot and tiring to visit during the summer and it is also not easy to find a decent beach. As a result we would be inclined to stay somewhere else nearby if you are visiting for more than a day or two and looking for a beach holiday, and then visit Syracuse as an excursion or day trip. Cassibile has a good beach and some good river beaches nearby. The town of Noto has some great Baroque buildings and makes for a great day out. As well as beaches and a modern town Eloro has a fascinating archaeological site.